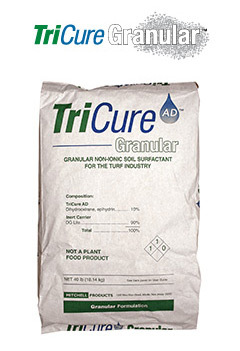 TriCure Granular is formulated to provide a convenient and effective method for the treatment and prevention of hydrophobic conditions in soils. Easy to apply by hand or with spreaders, TriCure Granular is convenient for use on slopes, bunker edges, greens, approaches, and spot treatments on problem areas such as localized dry spots. TriCure Granular is easy to spread on bunker edges, slopes, or anywhere getting a spray rig is difficult. Containing the same active ingredient as in liquid TriCure AD, use of TriCure Granular is an effective alternative to spraying. TriCure Granular utilizes DG-Lite dispersible granular as a carrier to quickly release the chemistry with no residual left after normal irrigation. The active ingredient in TriCure Granular provides effective treatment for both the prevention and cure of localized dry spots. In addition to slopes and bunker edges, TriCure Granular can also be effectively used on greens or any hot spots requiring fast application of TriCure AD chemistry. As with any application of TriCure AD, areas treated will show improved water infiltration enabling better protection and recovery from localized dry spots. Research at the University of Georgia showed the TriCure AD chemistry to increase water infiltration and soil dry-down characteristics. Hand watering expenses resulting from the development of hydrophobic areas can be reduced by the application of TriCure Granular. TriCure Granular does not contain any of the commonly used active ingredients that are associated with burning or phytotoxicity. TriCure Granular can be applied in the morning and safely watered-in in the evening without risk of burning.